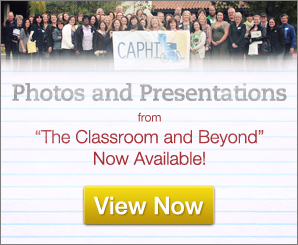 Stay in touch with CAPHI through email. If you are not on the CAPHI email list send your email address to Sherry Best at sbest@calstatela.edu so we can keep you in the loop! The GOOD NEWS. The California Commission on Teacher Credentialing (CCTC) approved the workgroup's recommendations that the PHI credential be retained! The credential will be good for probably another 10-12 years. In addition, the CCTC approved a PHI certificate that can be added as a Level II option for candidates who earn the preliminary Education Specialist credential in Moderate/Severe. However, the work is not over. We need to submit the standards for the Credential and for the Certificate, and we need your input. There is a very short turn around time on this project. This is our chance to make our own decisions about our credential. Draft ideas are posted (linked) below. Contact Information is in the "Letter." This website is under development. Please use our community feedback form to contribute your ideas and give feedback regarding this website. CAPHI membership includes a wealth of very experienced and concerned people who work in the Physical & Health Impairments (PHI) field. You are encouraged to use their expertise to help answer any questions you may have regarding PHI. Whether you are a student, parent, teacher, administrator or work in a PHI related field yourself, it's always helpful to get additional feedback. Please use Ask the Experts. © 2006-2008 CAPHI. All rights reserved. The Picture Communication Symbols �1981 - 2006 by Mayer-Johnson LLC. All Rights Reserved Worldwide. Used with permission.